UDM Downloads > Photo Frame Show! 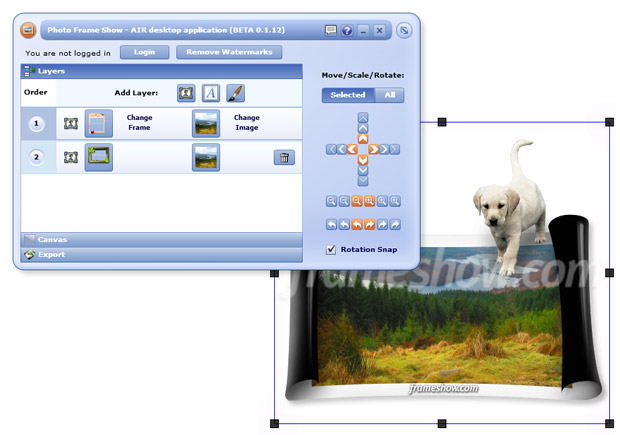 Use hundreds of frames of different styles, themes and categories, to enhance your digital photos with remarkable ease! Make your photo albums more unique and personalize your desktop, projects, websites, etc. through an intuitive user interface. Photo Frame Show latest version based on the Adobe AIR technology, offers advanced features, such as: - Use multiple frames/photos on a single design - Add and format rich text on your framed images to make your design more personalized - Add clipart, graphics or logos to give your framed photos a funny (teasing) or creative (professional) look - "Skew" objects (in addition to rotate/zoom/move) - Use the application on all major Operating Systems (Win, Mac, Unix) - Fast image manipulation/rendering Apart from the frames found within the application, hundreds more are available for download at the Online Frame Gallery. Impress your loved ones with frames from multiple categories: Classical, Shapes, Emotions, Occasions, Seasons, Sports, Locations, Music, Family and much more! Send framed images as e-Cards (via email) or use our free e-Cards online service on any occasion or event. Frame your photos and 'say it' with style!